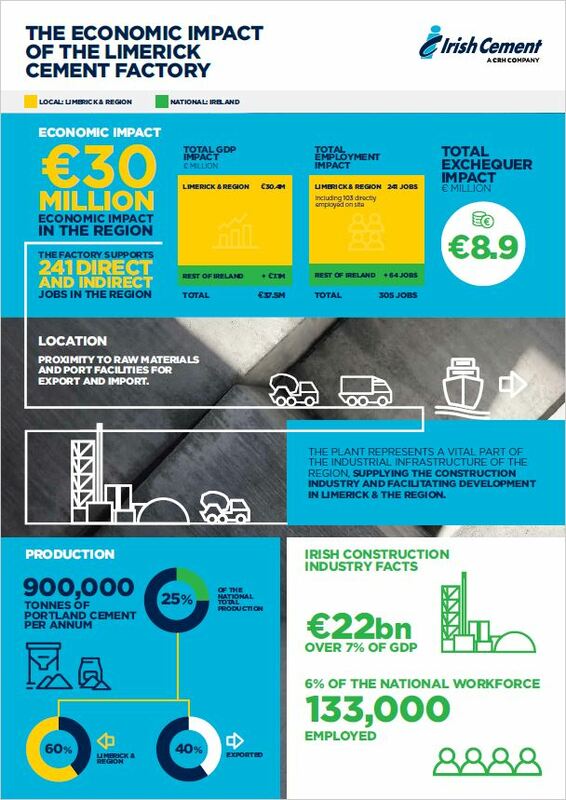 A recent independent economic impact study reveals that the economy of Limerick and the Mid-West Region benefits by some €30 million from the Irish Cement factory in Mungret, as part of an overall benefit of €37.5 million to the Irish economy. This wider economic contribution from the factory includes jobs, downstream businesses, haulage, port activity and exports. On the employment front, the factory has 110 full-time employees, and the business generated by the factory supports 305 full-time positions in Ireland of which 241 are located in the Mid-West Region. These jobs are in service companies like local engineering firms, transport, port related activities and catering. The study examined production, financial and employment data as well as CSO figures, and it shows that the factory is responsible for producing approximately quarter of Ireland’s cement output, with 60% of the cement going to customers locally to make concrete while the remaining 40% is exported to customers abroad. The location of the factory beside a supply of essential raw materials and close to local ports has been key to this success. Cement has been made on the site since 1938 and much of the local housing, schools and infrastructure has been built with locally produced concrete made using the local cement. The concrete used in the Limerick tunnel under the Shannon, which was opened in 2010, was made using the cement from the factory. The tunnel with a capacity for 40,000 cars per day has helped to reduce traffic volumes along the quays and bridges of Limerick, enhancing the city’s road infrastructure and regional competitiveness.